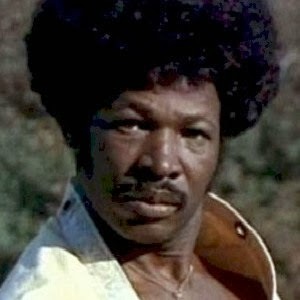 Dolemite is dead, but can I still write about him? All right. The three grand is certainly a great deal, considering that most of these so-called "gigs: pay bubkes. 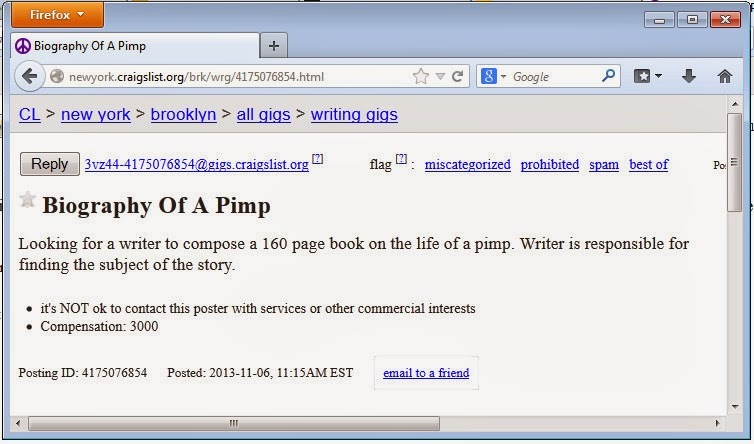 Why do you employ 10 words to declare that "Writer is responsible for finding the subject of the story" rather than the mere four it would take to say, "Find your own pimp!"? 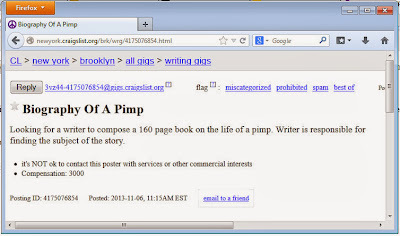 I don't have any experience writing pimp biographies, but is it wrong to have assumed that the pimp would be provided? I don't know the first thing about finding a pimp; can you pimp me — I mean point me — in the right direction. And will that direction be Detroit, or should I wait until DeBlasio takes office, when New York will likely become more pimp-friendly? Is your 160-page specification firm? Will that include the acknowledgements, glossary, appendix, and works cited pages? Define "life of." Do we need to discuss the pimp's childhood and education and pimp apprenticeship, or should I dive right into the main pimping? If my research reveals that my subject does not, in fact, keep his pimp hand strong, should I abandon the project and find a new subject? Will that three grand be paid in U.S. cash, or in "ho bucks"? I'm equipped to handle either.